All of us have deeply engrained, often subconscious, commitments to behaving a certain way in order to create outcomes we enjoy or expect. Naturally we may be committed “to be successful”. The opposite or other side of this commitment is “not to fail”, which after all is an important ingredient of being successful. We put energy into being successful and at the same time we put energy into not failing. The drivers of these two different types of energy are different and Kegan and Lahey (2001) call one the “commitment” (i.e. being successful) and the other one the “competing commitment” (i.e. not failing). They refer to balancing commitments with competing commitments as a dynamic equilibrium; one foot on the gas pedal and the other one on the brake. Helpers are often extremely loyal to others and seem to act from a place of duty. However, this commitment has a shadow side, a competing commitment, which they may not always be aware of and which can create a harness dictating a narrow focus on how to deal with life’s dilemmas. When I met Anoush, she was in her early thirties and already a very successful CEO of an important division of a large multinational. Reading her biographical information, I was struck by the fact that she seemed to subordinate herself to others, minimalised her academic successes as well as underplayed the fact that one promotion followed another. She seemed somewhat uncomfortable with the visibility these accolades gave her. Her 360 degree feedback report showed that her boss was delighted with her most reliable performance and was highly complimentary. Her peers loved the fact that she was always responsive and there for them. Her clients were delighted with her high levels of service, were loyal to her and to the company. However, her direct reports gave her very low scores for team-building, creating trust and delegation. Were these symptoms of a Helpers Syndrome? Just as we started what would be an intensive group coaching session to share 360 degree feedback, Anoush asked if there was still time to get a cup of coffee and when told that that was fine, she turned around and asked if she could get coffee for everyone. Mmm …. a Helper’s Syndrome, maybe? The commitment to loyalty can focus on delivering good results, being included as a member of a team, being seen as reliable and receiving praise or protecting others. Consequently, the other side of the coin, the competing commitment, can be the desire not to be marginalised or excluded, not to be seen as unreliable, not to receive critical or negative feedback and not having to see loved ones at a loss. By understanding this psychological construct we unearth a wealth of new insights into the basic human urge to be affiliated with others, which is an essential driver of our behaviour. My assumption based on experience working with many leaders is that a strong commitment to loyalty is an embedded value. Loyalty is not left in a filing cabinet at the end of the work day but leaves the building with the leader to guide him or her on how they create meaning and make sense of decisions impacting their relationships. Such leaders can be immensely dedicated, hardworking, curious and adaptable to find ways to deliver on their task. They may look for approval from others by being experienced as kind, supportive of their team and driving for consensus. They rarely openly compete with others and tend to show low levels of assertiveness being more comfortable to be seen as wanting to please, to be inclusive, collaborative and dependable. They are often a pleasure to be around. Their desire to take on the role of Helper can give them a unique and powerful role in the system they are part of: their family of origin, their own family unit, circle of friends and work environment. However, those who always help in fact exert power, be it often with kid gloves as they can be gentle and tactful. When Helpers sound assertive it is more likely during an off-line conversation with a trusted friend blowing off steam and talking about what they may say, or what someone else should say, rather than going on the barricades themselves to battle it out with an adversary. They would only risk that if they feel safe thanks to a strong sense of protection and containment in the context in which they operate. We all know people who are committed to help; some of them are indeed our most loyal relatives, friends or colleagues. Maybe we even recognise ourselves in this? How can we identify these competing commitments and better understand what can hold Helpers back from dealing with conflict which may become a derailer to success or happiness? Competing commitments, it will be clear, can be very, very strong drivers of behaviour. 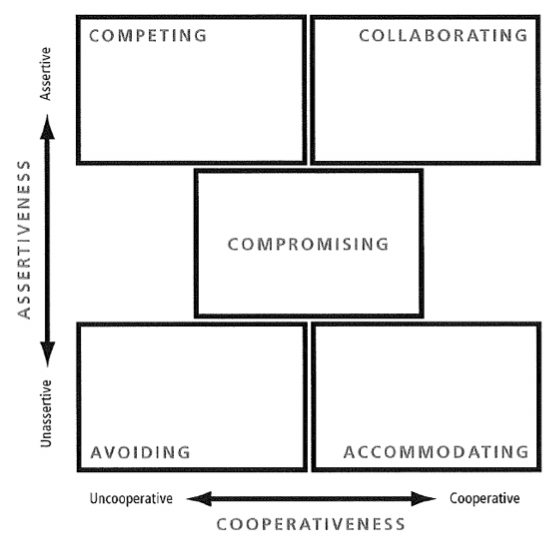 If we overlay these competing commitments resulting from loyalty to helping others with modes of conflict as described by Thomas (n.d.), we can fantasise about how Helpers make decisions and which behaviours may be their preferred default in conflict situations. When faced with disturbing news in an uncertain context Helpers may attempt to satisfy the concerns of others first and become rather unassertive, initially accommodating the situation or wishing to avoid it all together. Only when Helpers feel very secure in the knowledge of their own expertise and have strong support from powerful others, might they venture towards competing and winning but the driving commitment is satisfying the concerns of others, rather than satisfying their own concerns. In the absence of such strong, external support Helpers may put so much energy into managing the dynamic equilibrium mentioned above that they risk burn-out as neither their commitments nor their competing commitments prove a sustainable way of achieving results. We reconnect with Anoush as the group coaching session is underway and we discuss her 360 degree feedback with her. She was shocked by the feedback from her direct reports as surely, she only wanted to help them! It was time to ask the question: “can you take us back to the moment in your life when you realised for the very first time that helping others would be an essentially important and good thing?” Anoush’ mind immediately flashed back: “When I was seven my mother left my father and my two siblings. My father was devastated and had a very hard time coping. I knew that if I was there for him, helped him, comforting him, it would be better for him … for all of us. Even though I was very young my father and siblings came to rely on me a lot.” She rapidly connected the dots that this behaviour, which had been so important earlier in her life and had been the foundation in the beginning of her successful career, could back-fire in her current professional context where her direct reports did not want the intense levels of control that come with “too much help”. Her direct reports who had given her low scores wanted to be trusted, to experiment, to be creative, to explore, to grow and the protective leadership style Anoush used was really of no help to them whatsoever. If loyalty is the commitment that visibly steers the Helper’s actions, then the competing commitments often show subconscious decision making processes that keep the Helper static in his or her role. After all – they are not only loyal to others but also to themselves. They want to continue in their role of Helper as this is their comfort zone. Anoush acted out of loyalty not delegating to her direct reports to protect her team from failing. At the same time she stood in the way of her direct reports growing and developing. They made it very clear that they were not happy about that! They wanted Anoush to change, get out of her comfort zone and stop helping them so much. Maybe our mind drifts towards someone in our private life who appears to be in denial of bad news, who tries to avoid dealing with a dilemma, or who filters information not wanting to be the cause of other people’s sorrow or unhappiness. At some level this may feel normal and acceptable but is there a boundary where this behaviour becomes counter-productive? At its extreme can it become almost obsessive with the Helper believing their behaviour is truly in the best interest of others who may otherwise not be able to cope? The shadow side of the desire to help, which seems so noble, is that it can cause a void at a very stressful or demanding time when transparent communication is essential. The result of the absence of clear information can lead to confusion or lower levels of trust as people are left guessing. This can result in increased levels of interaction among others in the system constellation to fill the void with real or fake information or even gossip as they to try and complete the picture not only with facts but also with own assumptions and fears. Having looked at Helpers and their need for being loyal in the context of work, let’s also reflect on how this may play out in a totally different situation, for instance for a patient in the knowledge that he or she is dealing with end of life questions and experiences. Zoe had talked about vague but persistent physical discomfort and it seemed difficult to get a clear diagnosis. On the day she went to the emergency room of the Academic Hospital her husband did not know why she had gone there. It was not the first time that Zoe’s family members were not up to date about urgent and important matters. Zoe and I managed to meet as she left the hospital. “So what do you think it is?” I asked. She looked me straight in the eyes, gave a big sigh and said: “It is a tumour. Here we go…..here we go.” I went home devastated and over the course of the next five years until she died, often reflected on the dynamic of that evening. The juxtaposition of the clarity of what she said against the backdrop of her diffuse communication based on loyalty to protect others became a complex world for Zoe, her family and friends. Did she feel we could not cope and needed protection? We entered into a dance together as were impacted by Zoe’s commitment as well as her competing commitments. Loyalty, love and caring were her essential commitments but often left us confused about how to deal with her reality as we were grappling with what we assumed was left unsaid. Others made sweeping statements suggesting Zoe was in denial. Not necessarily so, it seemed to me. If we look at the Thomas-Kilmann model we can assume that there was a high reliance on the avoidance and accommodating modes, an understandable coping mechanism for someone who is also guided by the competing commitment of not wanting others to worry or suffer. At times of stress, the Helper can keep up appearances like no one else. In a case of serious illness, the treating physicians can also become part of this inner-circle and deserve to be included in the loyalty construct. This becomes clear when we observe how patients communicate with their doctors. The competing commitment of not wanting to worry the doctor seems to become more important than the loyalty-commitment to the self. The potential risk: out of loyalty and not wanting to worry the doctor, important statements are not made; feelings not shared and questions are not asked, thus withholding information from the doctor who needs to make decisions about matters of life and death. But Zoe did deliver on an important objective: throughout her illness she was a tower of strength and an inspiration to all around her, who were at a loss to understand how she managed to stay upbeat given her declining health. Her guiding principle of loyalty brought energy with it for others coping less well than she did. Her focus was on making sure others felt good even if she did not. Zoe’s commitment to loyalty and helping others gave her energy to almost her last day in how she dealt with the conflict of ultimately having to disappoint everyone as she was not able to conquer her illness. Would Anoush and Zoe have been better off rationing their compulsion and risk short-changing others as well as themselves and ultimately not help anyone? It depends. In the case of Anoush, it was important that she realised that her behaviour was not helpful to others; to her direct reports in particular who objected to not being trusted to deliver. Anoush’ behaviour was also putting herself at risk of undermining her own performance and resilience. Left unchecked this would cause an assumption driving her competing commitment to come true: she might fail! In Zoe’s case we were the ones who had to figure out how to be best possible friends as we engaged in a dance based on mutual loyalty and helping each other as the outcome, sadly, was only too clear and non-negotiable. So, as useful as it can be for Helpers to be in our organisations and in our lives, it is important for them and us to understand this construct. We can then see what the visible commitments are such as loyalty but we can also explore what the competing commitments are that all combined show a lack of willingness to stop helping and create space for others! As we saw from the above examples this can take many shapes such as not delegating, wanting to stay in control, and withholding information at important times. A behaviour that at first glance seems so noble gets in the way of creating trusting relationships. Unchecked it may bring about the often unconscious fear the Helper has in terms of competing commitments: they may get marginalised or excluded, they may be seen as unreliable, they may receive critical or negative feedback or even realise that loved ones cannot be protected and maybe at a loss. Kegan, R. & Lahey, L. (2001). The Real Reason People Don't Change. Harvard Business Review, 11, 85-92. A very useful perspective of how the Helper may need to grow! The two cases illustrate these ideas very effectively. Thanks Hanneke! Excellent. I have worked with a number of leaders with these competing commitments. In every case their direct reports were afraid to give them authentic feedback for fear of hurting them. Also, in every case, the direct reports were stifled in their growth by a leader unable to allow them to stretch and grow. They would not delegate and did not understand how to authentically coach someone towards growth. Helping was harmful. Insightful piece on how people sometimes avoid conflict while thinking that they are not, because they confuse accommodating with giving others what they need as opposed to what they want. What I also appreciate is the description on how some leaders can smother their staff into disempowerment. Several successful leaders seem to have this thing called ‘gravitas’. Leaders with gravitas are experienced as having dignity, poise, and are seen as mature and possibly even wise. For those people who seem to be effortlessly successful, but at some point, begin to wonder if the construct they have built for themselves will hold, this blog explores how to develop maturity and wisdom. Indeed, the blog uncovers that key to developing gravitas is vulnerability and therein lays the challenge to leave the demanding ego behind and to become more comfortable with showing vulnerability but ultimately becoming an authentic leader.